Dr. Aedín McLoughlin, Director of Good Energies Alliance Ireland, will speak before the United Nation’s 62 nd Conference on the Status of Women on Wednesday, March 14th as part of a session on the global resistance to fracking and its infrastructure. Aedín will be among five panellists to talk about “Frontline Leadership: Rural Women in the Anti-Fracking Movement.” The other four panellists will be Anna Klein, Mining in Haiti Project, Julia Walsh, Campaign Director Frack Action, Chris Schimmoeller, Anti-fracking activist and Jeanne Shenandoah, an elder from the Onondaga Nation. The priority theme of this year’s Conference on the Status of Women and Girls is the challenges and opportunities in achieving gender equality and the empowerment of rural women and girls. The review theme is the participation in and access of women to the media. Wednesday, 2nd of December, Newstalk Fm morning show hosted a short debate on fracking. The talk was live, just half hour before the Joint Oireachtas Committee on Energy where TD’s questioned EPA research study on fracking. The talk was between Dr. Aédin McLoughlin, director of Good Energies Alliance Ireland, with a PhD in Biochemical Pharmacology [Cancer Research] and Tony Alwright, an independent oil and gas consultant and moderated by Ivan Yates, ex Minister for Agriculture, Food and Forestry from 1994 to 1997, current host of the Newstalk Breakfast show. Ivan started by stating that he knows nothing about the fracking subject just what he heard from the U.S. and he maintained impartiality through the interviews. More interesting was that, the oil&gas consultant, Tony, was also not very familiar with the situation in Ireland. Using words like “possible” and “everything is relative” he gave us general facts about fracking, and as Aédin stated a “sanitised version”. Tony spoke about the impact of one well; Aédin reminded listeners that fracking involves hundreds, if not thousands of wells, changing rural areas into industrial zones. Fracking causes major pollution with contamination of air and water. 5% of wells leak immediately on completion, 50% of them leak after 5 year, causing major greenhouse gas emissions. Listen to the recording and let us know what you think. Meeting after meeting after meeting! We started at 9am with a breakfast meeting, then continued with a Republican Congressman till 11.30, when we boarded a bus that took us on a six hour journey to Ithaca, New York State. I don’t know whether it was my imagination or not, but I felt a load lifted off my spirits when we cross the border out of Pennsylvania and into New York! It was not that we saw hundreds of people impacted by fracking, it was the knowledge of what was being done to this beautiful countryside and rural population and what lay ahead for them. Fracking has only started in Pennsylvania – they have fracked 24,000 wells so far but the intention is to frack over 80,000! So the worst is to come and everyone will be impacted. “We are building up a legacy of waste”, said one of the speakers. I think it is worse – they are building up a legacy of harms to the people, to the environment and to the earth. The industry has built up myths that are now the majority belief, e.g. shale gas is a clean fuel; shale gas can be developed safely. Shale gas contribution to the economy and to energy security has been greatly exaggerated. When they come into an area, they destroy existing economies, e.g. tourism, farming. The dairy industry is weakening in shale gas areas. Hospitalisations increase in areas close to fracking. Medical conditions such as rashes, nosebleeds and asthma appear. Children are worst affected. Important discourse: Can the industry be regulated safely? There is NO evidence that it can. Hypothetically, it can be improved but not to the extent that we can have confidence that it will cause no harms. Why? It is a unique industry with unique technologies that we are only learning to use. It is dispersed through the landscape – pads, pipelines, compressors, with risk of emissions, spillages, accidents. It extracts stuff that has been in the ground for 100 million years. Huge volumes of wastewater is then dispersed throughout the environment without acceptable means of disposal. At the end of the day, the only recourse by citizens is through the courts – expensive but the last stand of independent judgement. We reached Ithaca – a delightful university town when many of the fracking scientific heroes live – and there they were! Tony Ingraffea, Bob Howarth, Helen Slottje. What a privilege to spend an evening with them and share a lovely Asian meal. I don’t mind admitting that I was awe-struck! And that doesn’t happen too often. Representatives of the indigenous peoples from the Onondaga Nation were present with Dr Steingraber from the Concerned Health Professionals of New York, several legislators, our fellow campaigner Renee who visited us last Easter with Julia Walsh. Between courses, we had presentations from all these people, starting off with a prayer from the Onondaga representative, presentations from Tony Ingraffea and Bob Howarth (who showed how shale gas wells leak almost as a matter of course and shale gas is a major contributer to greenhouse gas emissions. This was heavy stuff but the atmosphere lightened as the focus turned to the successful campaign against fracking in New York. Important components in the campaign were involvement by small communities to bring in local bans, involvement by celebrities, strategies of direct action, advocacy and shadowing of Cuomo by the campaigners. Most important of all was emphasis on Public Health. Everyone present were still in a celebratory mood. A few said that it was a miracle that the ban was imposed! Great credit was given to Governor Cuomo for his wisdom and courage in signing off a prohibition on fracking in New York State. Believe it or not – at 10.00pm we had to leave the company and get on the bus again! We had to do another 3-hour drive to Albany. At 1.15am, we arrived and once again, fell into bed. Stunning success of Renewable Energies – Prosperous Communities! The event “Renewable Energies – Prosperous Communities” has been a success. 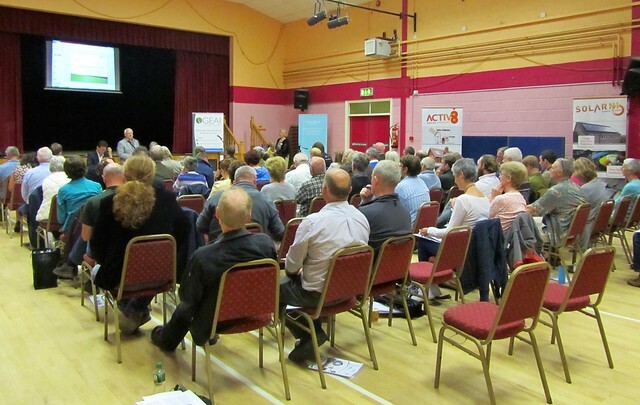 Yesterday, almost 100 people gathered in Manorhamilton to take their energy future into their own hands. 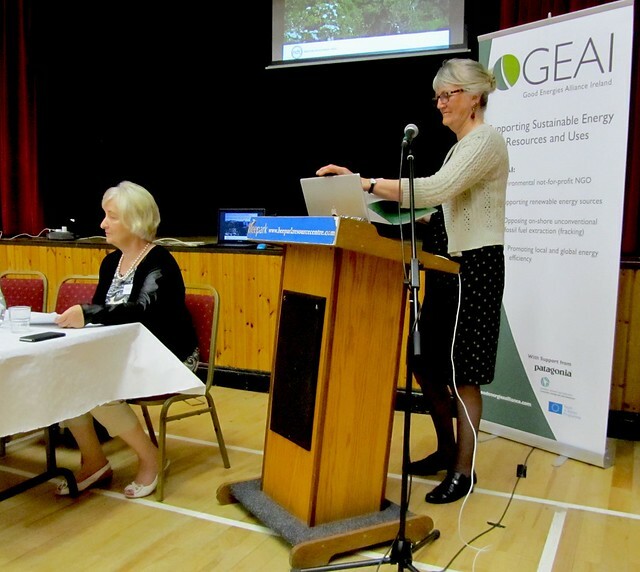 The main outcome of this pioneering event was the decision to develop a plan for community-owned renewable energy projects in North Leitrim. The event, organised by Good Energies Alliance Ireland and Love Leitrim was also intensively followed on social media and it was livestreamed globally. Pauline Gallacher, Neilston Trust (Scotland), Eamon Ryan, Green Party leader, and Cormac Walsh, Energy Co-operatives Ireland, were the main speakers. Gallacher’s presentation was one of the most inspiring ones. “Use community-owned energy to stimulate ownership of the carbon emission reduction agenda and harness your own resources to build your own sustainable future”, she told to the Irish audience. “Renewable Energies – Prosperous Communities” was aimed at raising awareness of the opportunities open to local communities to benefit from renewable energies, look at the potential to generate income and jobs for the community and identify local champions of renewable energy. During the day all the people attending had the chance to learn about successful community-owned experiences from Ireland and Scotland and also to raise every question, doubt and misunderstanding they might have had. “We are delighted with the success of the event” GEAI director Aedín McLoughlin said at the end of this day of workshops and discussions. “It was great to see so many people , but this is only the first step of a bigger project. Renewables can be the source to re-energise rural communities, bringing jobs and income, and we want to replicate this event in many towns and villages across Ireland, providing sustainable alternatives for fossil fuels”, McLoughlin stated.